John Calvin Coolidge, the son of a farmer and storekeeper, was born in Plymouth, Vermont on 4th July, 1872. He became a lawyer in Northampton, Massachusetts in 1897. Coolidge joined the Republican Party and eventually became the town mayor in 1910. This was followed by periods as a state senator (1912-15), lieutenant governor of Massachusetts (1916-18) and governor (1919-20). At the Republican National Convention of 1920, Coolidge was nominated as vice-presidential candidate, in support of Warren Harding. Harding's isolationist foreign policy was popular with the electorate and he was voted into office by the widest popular margin in history. When Warren Harding unexpectedly died on 2nd August, 1923, he was replaced by Coolidge. The following year he easily won the presidential election. 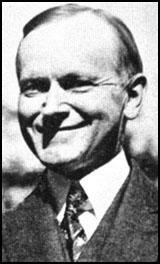 Coolidge's period as president was marked by economic prosperity. Companies in the United States also began to make full use of what became known as mass production. This increase in output enabled America to produce items that were cheaper than those manufactured by her European competitors. Inflation remained low while incomes increased by an average of 35% during this period. John Calvin Coolidge refused renomination in 1928 and he retired to Northampton where he wrote his autobiography. John Calvin Coolidge died on 5th January, 1933.